I did these sketches for a friend to help with her non-profit project. I was asked to portray India (Chennai, in particular) in my own creative way. I had no idea where to start but luckily my friend mentioned the heat, the autorickshaws and the monsoon season. I'm not a particularly patriotic (I would rather not spit/piss on my country than protest evil culture-destroying things like coca-cola) person but I felt a tiny bit fonder of this city by the end of my post. 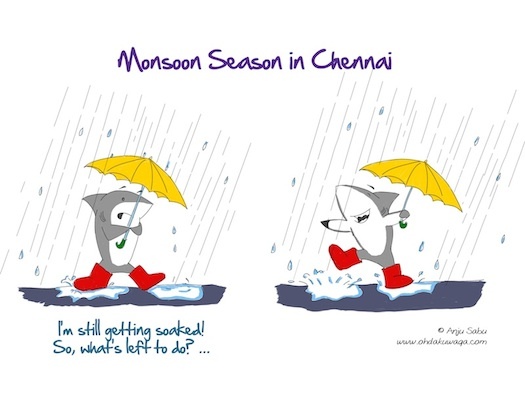 It is crazier than usual in Madras (that's how some still refer to Chennai) during the rains. I ventured out once on a particularly bad night praying I don't drive my car into one of our giant man-holes or open sewers. Turns out, I only do that when it isn't raining and everything is perfectly visible. The Autorickshaw experience in Madras is not entirely fun because bargaining with the driver usually changes your mood from excited to foul. There's something that resembles a fare meter in all autos but don't be fooled - they're just ornamental. 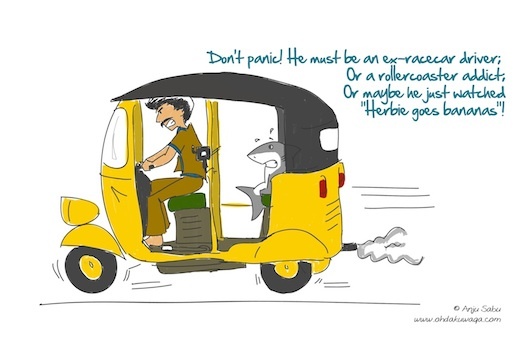 Most auto drivers drive like they're in "Whacky races". The day we watched "Herbie fully loaded", we suspected that our driver had watched it too because he was like Speed Racer on Redbull. Then there's the summer heat. 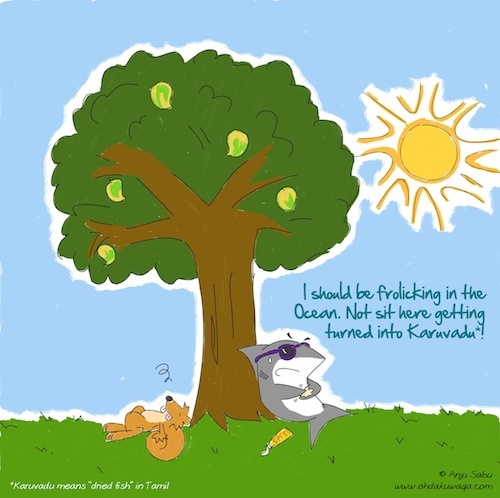 I spent every summer while growing up in Madras. It was never as bad as it is these past few years. The tall apartment buildings probably block the sea breeze and the excess use of air-conditioners & refrigerators probably add to the heat - it can only get worse. It doesn't stop anyone from being out and about - I'm starting to think nothing can stop people from being out and crowding up every single spot in the city. Having said all that, Madras is my favourite city in India. Many will roll their eyes and be like "Chennai?? it's not as cool as Bombay or Bangalore! Nothing good ever comes to Chennai!". They should all just move to the above said cities, right? I think Madras has a great balance of tradition, modernity and uniqueness. It's safe (compared to most cities in North India or so I've heard) and I suppose we have many resources that we take for granted. Despite my angst at autodrivers, I've come across my share of honest ones who drive back all the way to return forgotten mobile phones or laptops. The monsoon rains are awesome to watch while sitting in your veranda and drinking tea. And the heat...well, it just makes cool things a lot cooler.